Information Technology has made a major impact on almost all aspects of life. Supply chain systems monitor and control goods; online purchases continue to grow; almost all businesses have web pages; even healthcare institutions have embraced new technologies. But, has information technology affected how assisted living facilities function? 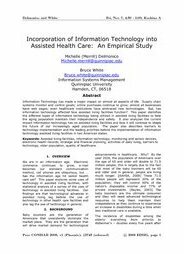 This paper identifies the different types of information technology being utilized in assisted living facilities to help the aging population maintain their independence and safety. It also analyzes the current impact information technology has on assisted living facilities and how it will continue to shape the future of our increasingly aged population. The paper also describes barriers to technology implementation and the leading priorities behind the implementation of information technology assisted living facilities in two American states. Keywords: Assisted living facilities, information technology, monitoring and sensor devices, electronic health records, strategic and financial planning, activities of daily living, barriers to technology, older population, quality of healthcare.